After being on Koh Tao for over a month and hearing incredible things about the famous Sail Rock Saturday trip with Sairee Cottage Diving, I decided it was time to experience what all the fuss was about. This trip is considered a special one as the majority of dive shops on Koh Tao that visit the site only take the plunge once a week. We had to get up earlier than usual to arrive at the dive shop before dawn, which for me was rather difficult, but it was worth it to be the first boat at the dive site dubbed “the best in the Gulf of Thailand”, and have the whole place to ourselves. As the boat takes an hour and a half to reach the dive site, everyone had plenty of time to wake up (via means of mass coffee consumption!) and eat breakfast, and what a breakfast! I was expecting something along the lines of a croissant and fruit, but they provided the full Monty – sausage, bacon, fried onions and tomatoes, boiled eggs, spring rolls, bread rolls, and salad. After the feast there was still time to lie back and relax on the cushioned seating or sun deck, before having a dive briefing, and discussing what everyone would like to do and see throughout the day. 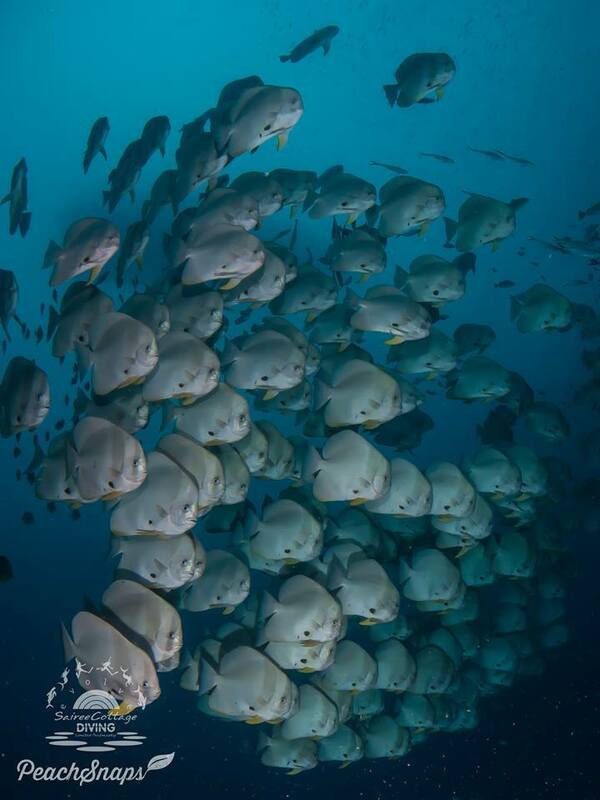 Upon arriving at the site, everyone was readily equipped and would probably be jumping up and down had they not been wearing 10 to 12 kilos worth of scuba gear; you could really sense the excitement among all the divers on board. We entered the deep blue coloured water and descended into the unknown using the buoy line as a visual reference. There was easily 15 meters of visibility and a small current on two sides of the pinnacle. For new divers the current may have presented a challenge, but for others, like myself, it made the experience even more interesting. Within a minute of descending, I found myself surrounded schools of Chevron Barracuda, which is always a great sign of what is to come. I’d previously been told that a lot of the inhabitants seen around Sail Rock are notably larger than what one would normally find among dive sites closer to Koh Tao; I can confirm that all of these witness statements are most definitely true. 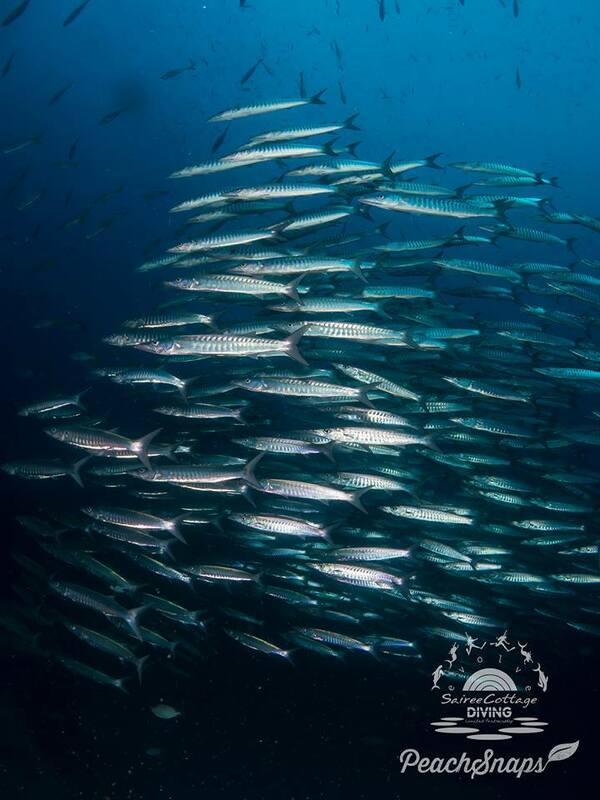 Upon gliding around the pinnacle, I saw some of the biggest of the following species that I’d ever seen; Batfish, Blue Ringed Angel Fish, Giant Groupers, Queenfish, Kingfish, Trevally, King Barracuda and Snapper. 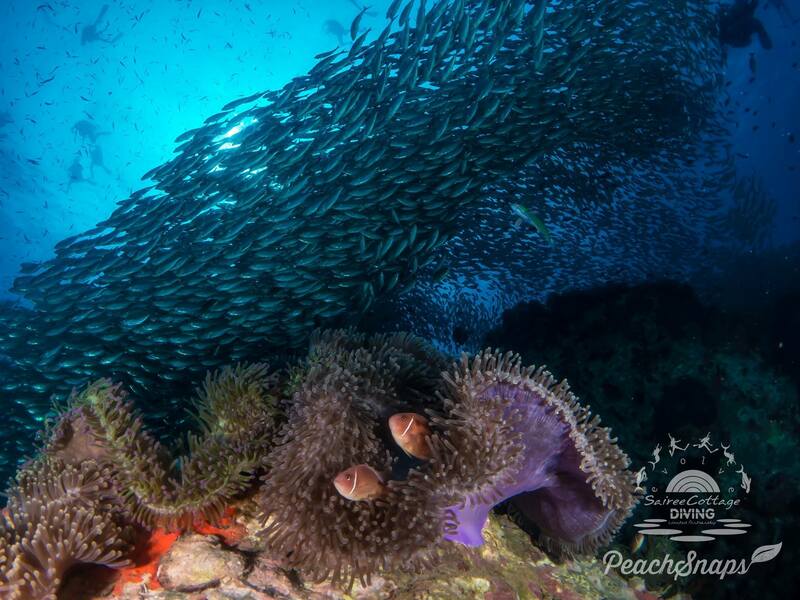 The bottom of Sail Rock pinnacle starts at approximately 28m deep and is rich with an abundance of aquatic life from top to bottom. During the two dives I had cruising around the pinnacle, I found countless Moray Eels, Hermit Crabs, Pipefish, Shrimp, and numerous varieties of Nudibranch. The visibility had unfortunately deteriorated during the second dive at Sail Rock, not only that, it began to become a little crowded, so for the third dive of the day it was decided to head to a different dive site. But before we left lunch was served, and while the huge breakfast had filled me to the brim, the 2 dives had created an appetite again, so I happily tucked in to the Sweet & Sour Chicken with rice, and a fried chicken wing or two. 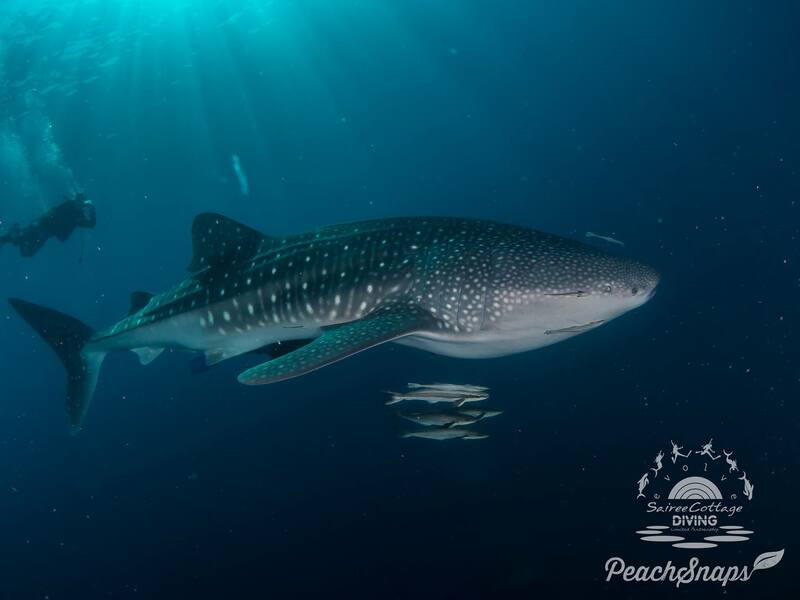 While the boat was heading back towards a dive site closer to Koh Tao the captain received a radio message stating that a Whale Shark had been spotted at the dive site ‘South West Pinnacle’. This dive site is also quite a distance from Koh Tao, and not in the direction we were heading, so some dive schools wouldn’t have done anything about it, but it appears that is not the way Sairee Cottage works. If they can create a better experience for their customers, they will take the time and effort to do so. So the boat changed direction and off we went. It took us 40 minutes to arrive at South West pinnacle, unsure whether the Whale Shark was still present, and everyone proceeded to enter the water for their third dive of the day, in hope of witnessing a much talked about rare sighting among divers of Koh Tao. The visibility was extremely poor around the pinnacle; little enthusiasm was shown, as many divers were solely fixated on the thought of ticking an item off their bucket list. My buddy and I decided to cut our dive short as we figured we were probably in the wrong place to see a whale shark. Upon ascending and preparing to board the boat again, the captain and boat boy yelled ‘WHALE SHARK’, pointing at the water I was treading on. I ducked my head in the water and before me was the creature that I had always hoped to see, literally only a few meters beneath me. Knowing I still had 140bar of air left, my first instinct was pull my dump valve, put my regulator back in my mouth and head back down. There was so much adrenaline flowing at this moment, I’d completely forgotten to put one of my fins back on my feet that moments ago I’d removed to board the boat. My buddy and I hovered around the boat at around a 5-7 depth for the next 5 minutes or so until eventually the Whale Shark not only returned, but also snuck up behind me. By the time I’d noticed it, it was so close I could almost touch it (had I tried). It then turned and proceeded to glide past us in a figure of eight motion for a few minutes. There were times I felt like we were on a direct collision course, but the whale shark effortlessly moved out the way at the last moment. I cannot describe how incredible this experience was, it is certainly one that will be hard to top! Everybody on board the boat had a story to return home with. We all shared the moment together, and enjoyed an ice-cold beer and some music to end the day on the way home to Koh Tao. They say that Sail Rock day trips are special; doing it with Sairee Cottage Diving was no exception. 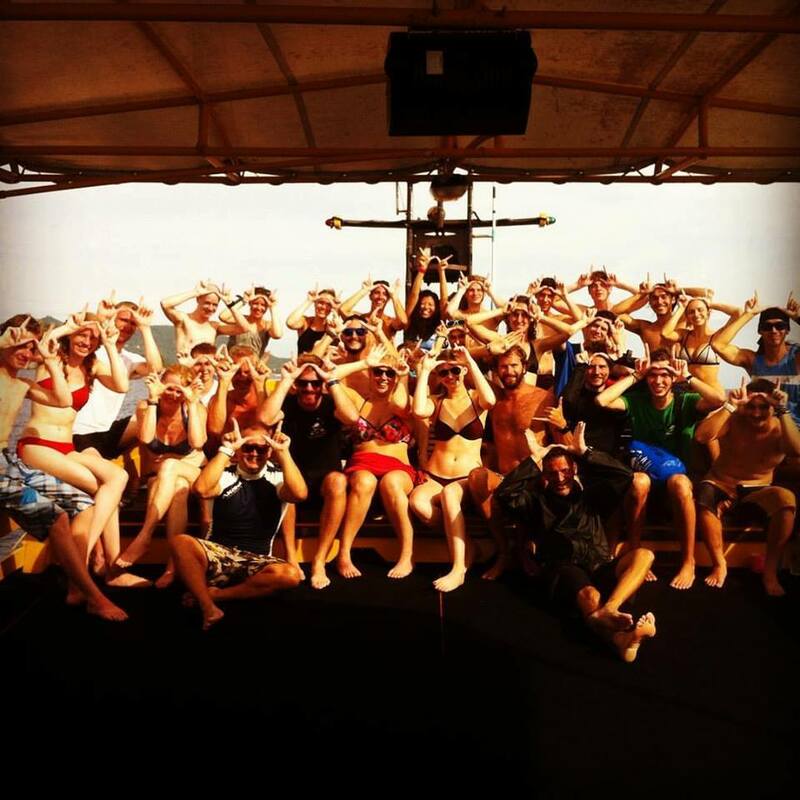 The food, the boat, the staff, and of course the Whale Shark, all contributed to making this an amazing day out!